If you're not a farmer who grows, harvests, cans, stores, raises, & butchers her own food (plus whatever verb applies to beekeeping) you need to pay others for their efforts in those areas. And unless your time is so valuable that you'd rather pay a butler/cook to shop and prepare meals for you (or more likely, eat at restaurants all the time) you need to buy food. Here are my household management tips for spending less money on food. No matter your level of income, it's important to have a general idea of how much discretionary spending you can afford each month. You can use online budget tools like Mint, a simple spreadsheet, a pen-and-paper system, or watch a few episodes of Til Debt Do Us Part to figure out your grocery allowance: income minus fixed expenses (like rent, utilities, transportation, other bills, and savings) will tell you what you can spend on food, plus your "fun money" for entertainment, clothing, gifts, etc. With a little planning, you can eat pretty well on under 10$ per person per day. The easiest way to hold yourself accountable is to pay only in cash from a jar; when the jar runs out, you have to stop spending (the Til Debt method). If you'd rather use a credit card (and there are good reasons to, such as building up your credit history or benefitting from rewards systems) make sure to be accountable to yourself by reviewing your monthly statement. The method that works for me is to stick a piece of paper on the fridge with the monthly food amount at the top; every time I spend money I have to write it down and watch the balance decline. Knowing I'll be shamed by impulse purchases helps me control them. Much has been made in recent years of the dangers of undisciplined small purchases. You are cheating yourself out of substantial savings every year with bad daily habits that you could satisfy more cheaply. 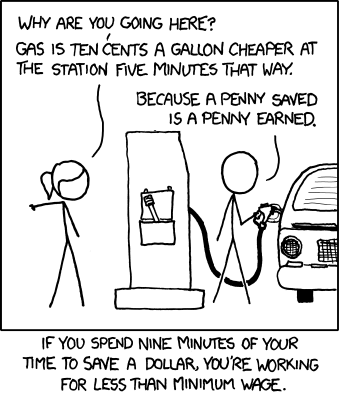 The most common examples are paying 5$ for a fancy coffee on your way to work or 10-15$ for a fast-food lunch (which honestly tends to be pretty mediocre). 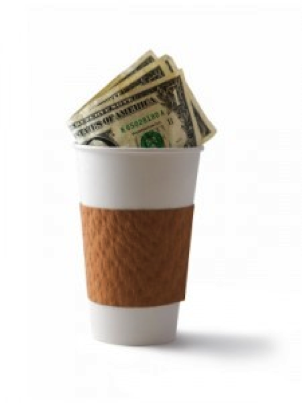 If you prepared the same drinks and meals at home they would cost much less over time, even factoring in the higher prices for an excellent coffee machine or premium lunchtime groceries. For some people, financial discipline comes easily. These people can microwave soup at the office every day and easily avoid temptations. Other people (myself included) have a more complicated relationship with food: it's emotionally satisfying, it's a treat, it's a way to enjoy time with friends. There are ways to stay on track while not feeling deprived: invite friends for a home-cooked meal, reward yourself with a piece of chocolate at the end of the day, or build a reasonable amount of restaurant meals into your budget. When you do eat out, try to make it worth the money. Not all grocery stores are created equal. Some charge more for convenient locations; others have smaller selections, others still specialize in a smaller range of products. If you don't have time to shop in multiple places, you might prefer going to a megastore once a week. If you have a car and plenty of storage space at home, a membership at Sam's Club or Club Price might be worth it. But if you prefer taking an afternoon to browse, there's nothing wrong with store-hopping in a market district. Just don't make the mistake of undervaluing your time in your quest for a deal. You'll eventually find a cooking style that matches your level of confidence in the kitchen, your food preferences, and your shopping habits. Stocking the pantry with what you actually need and the fridge full of (unexpired) food you want to eat is a skill that takes time to master. A little planning goes a long way: are those on-sale cauliflowers a good deal, or will you throw out more than half because you're sick of the one cauliflower-cheese recipe you know? What groceries do you need for a week's worth of dinners, and how will the leftovers combine to form lunches or the components for the next dinner? Are you really going to eat all that kale? Next week, it's time to get technical: how to master coupons, apps, unit pricing, sales, and more.